LOL, this almost makes me want a beer...almost! I should have made this for my hubby...he turned 63 last week and he would've gotten a kick out of it too! Very clever! 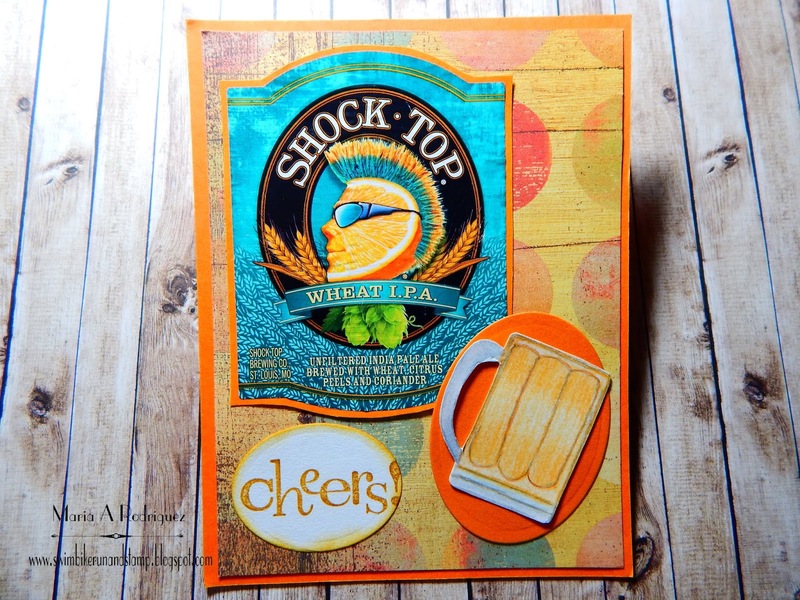 Super cool label and fabulous card!! Awesome job with the beer mug!!! What a cool way to incorporate the actual packaging onto your card! Love this! Wow, that is the coolest label and such a fun, colorful card! How perfect for a guy! You did a great job on the beer mug. I don't think I can even draw a stick figure. Awesome! ohhhh that is so clever to actually use the label ON your card! brilliant! love the colorful and artful labels. great use! What a COOL CARD! You know, i recognize the label, but never noticed that the mohawk was wheat! Anyway, awesome inspiration, awesome colors! Two thumbs up! Cheers! Oh, and great job on your hand-drawn mug! Super awesome take on the challenge teammie! I love that you used an ACTUAL label! Hmmmm I did not know there were so many different flavours of Shock Top, I will have to keep a look out for those!